Get inmersed in Madrid city center walking through the old streets accompanied by our tour guide. 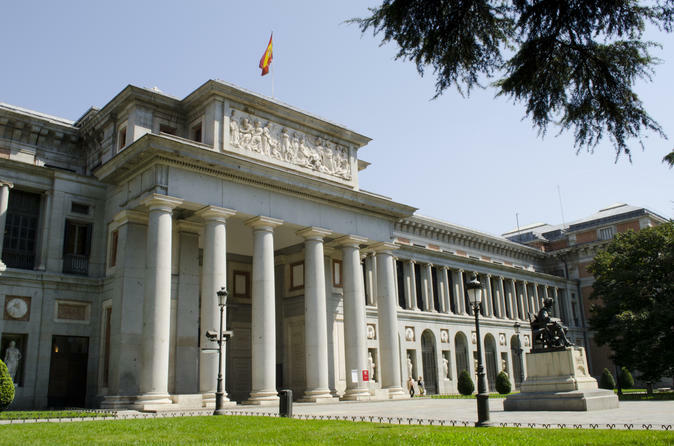 Have preferent access to the unique Prado Museum entrance, skiping the line with your included ticket to visit it on your own and enjoy plenty of time inside one of the most important galleries in the world. Walk with us through the Madrid old town, accompanied by our guide. Starting from the Debód Temple, we will cover the most important and emblematic points of the city center like Puerta del Sol passing through Plaza España, Sabatini Gardens, Plaza de Oriente, Royal Palace of Madrid, the Cathedral of the Almudena, Mayor Street, Plaza de la Villa, the core of Medieval Madrid and its winding streets around, San Miguel Square and its famous market, Arco de Cuchilleros, Plaza Mayor and more. Then we’ll include a “fast lane ticket” to visit on your own one of the most important galleries in the city, Prado Museum.